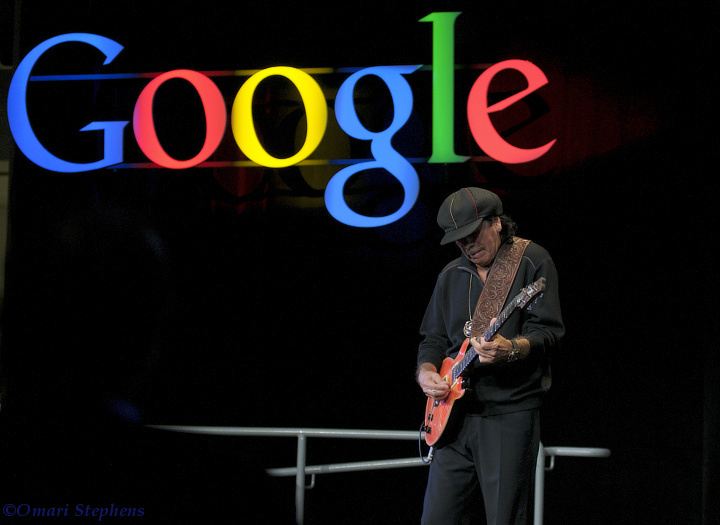 Last Friday, Carlos Santana came to the Googleplex. 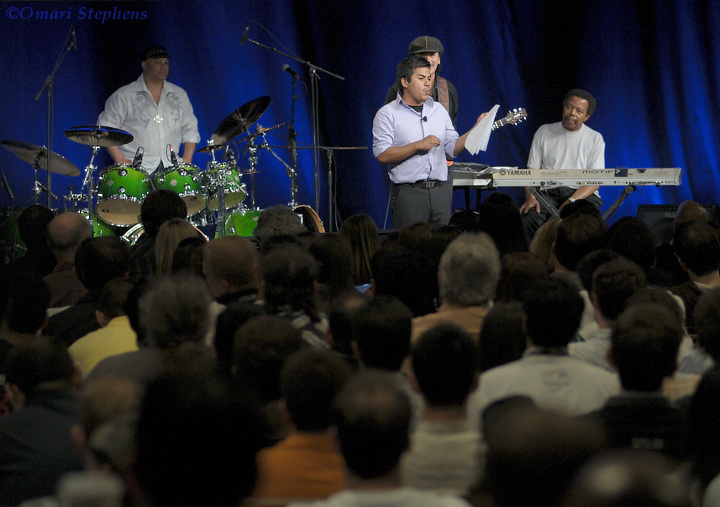 As with most of these visits by well-known performers, he was there to perform, but he also came with a message. In particular, this visit was in part an effort to get the word out about his project Architects of a New Dawn (AOAND), a business venture with the stated mission "to inspire, uplift, engage, and transform the global community through music and positive media content to help bring about a world where we chose peace over conflict and love over fear." 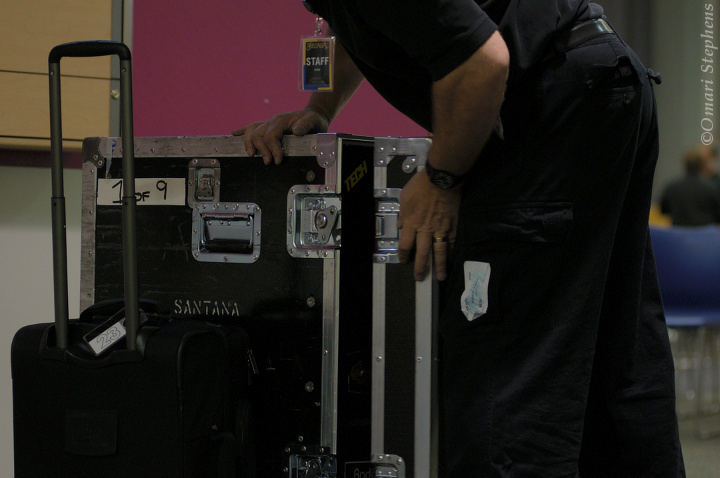 To that end, the event encompassed three parts: a discussion about AOAND, an interview with Santana, and a concert. The first part began with a short promotional video; despite seeming sort of kooky, the video was easy to relate to and the message — AOAND's mission — was clear. It continued with a discussion of AOAND and what, in hindsight, appears to have been a presentation of the business plan by the AOAND team. 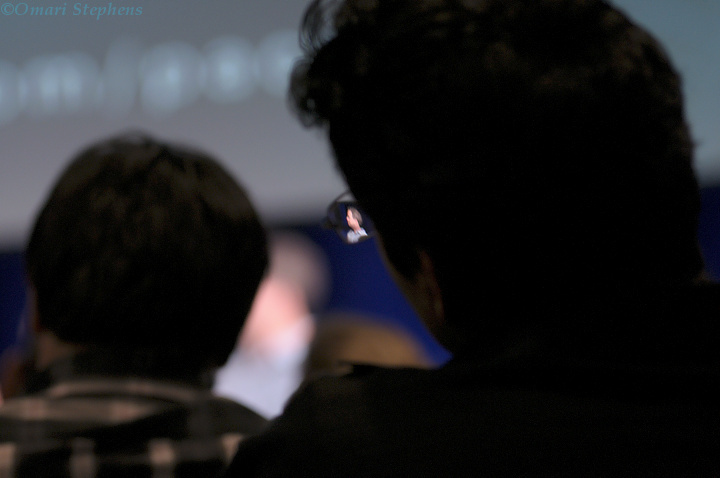 As might be expected, this was quite dull, though to their credit, some of the speakers did their best to try to hold our attention and connect with us. The interview was genuinely interesting, and gave Santana an opportunity to expound on his humanitarian efforts, his musical origins and influences, and other bits of his psyche. I found it both surprising and telling that after discussing some spiritual aspects of his relationship with music, and of others' relationship with his music, Santana quipped something along the lines of "You probably think this is hippie stuff I'm talking about… Well, I'm still a hippie." 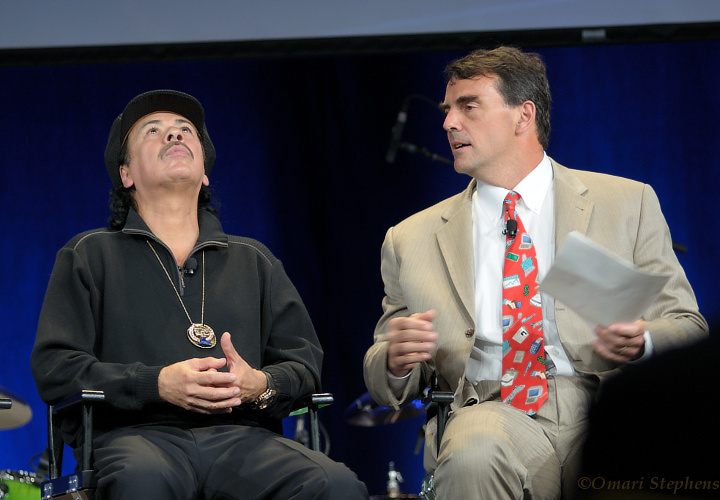 As the interview came to a close, the interviewer coyly revealed that he had written some alternate lyrics to the song "Smooth" that he wanted to perform with Santana. After asking the audience if they'd like to hear it and receiving a resounding affirmative response, Santana simply said "Cool; let's do it." The modified song was called "Riskmaster," and dealt with something about venture capitalism. And much to the chagrin of the "yea"-voters, it was pretty atrocious. As someone who can practically sing "Smooth" in my sleep, it was painful for me to hear the interviewer-turned-singer miss the intro and start reciting the lyrics off-beat and out-of-key — it was more chanting than singing anyway. But as the performance went on, I was surprised to find myself getting into it. The interviewer found his confidence and his rhythm, and he and Santana started synchronizing and cuing off of each other. By the time he ran out of lyrics, I was thinking "where's the rest?" rather than "thank goodness it's over." It was still incredibly cheesy and the lyrics were still pretty bad, but it felt like a poorly-written poem that was still worth listening to if only for the rhythm of the words backed by the sound of Santana's guitar. "Riskmaster" served as a surprisingly fitting segue to the first part of the concert, which was a poem authored and presented by someone from the AOAND video. It was written partly in English, partly Spanish, and I thoroughly enjoyed it. The poem was a natural juxtaposition to the performance just before — the words were well-chosen and incredibly meaningful, but there was no background music. Whereas the rhythm for "Riskmaster" came mostly from the band, here the rhythm here was intrinsic in the well-practiced telling of the poem. After the poem, the concert got started in earnest. 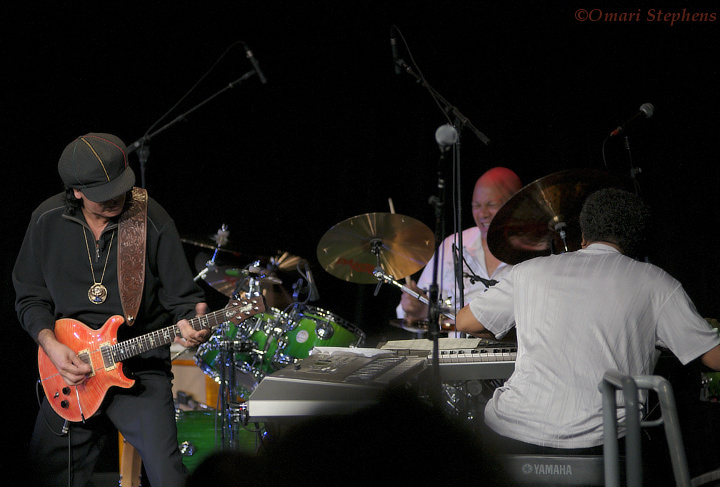 In addition to Santana on guitar, the trio featured Narada Michael Walden on drums and Chester Thompson on keyboard (edit: had these reversed earlier; oops). The songs were a lot of fun, and frequently broke into long bouts of improvisation and soloing. It was clear that the three were having as good a time onstage as we were in the audience. Over years of listening to Santana's music, I had never given much thought to why things sounded like they did or how it was that those sounds came to be. I found the music intoxicating, and that was that. That said, this concert gave me a newfound appreciation for the techniques and practice that go into turning out those screamin' solos. Watching him use his guitar onstage, hearing what came out of the speakers, and thinking about how much coordination must be required to have accomplished some of the acoustic feats of some of his past songs reminded me of one of my favorite Best of Craigslist postings, but moreover, it will certainly increase my appreciation of the music, and has already. The end of the concert happened fairly quickly. The group finished a last few notes with a flourish and were done. 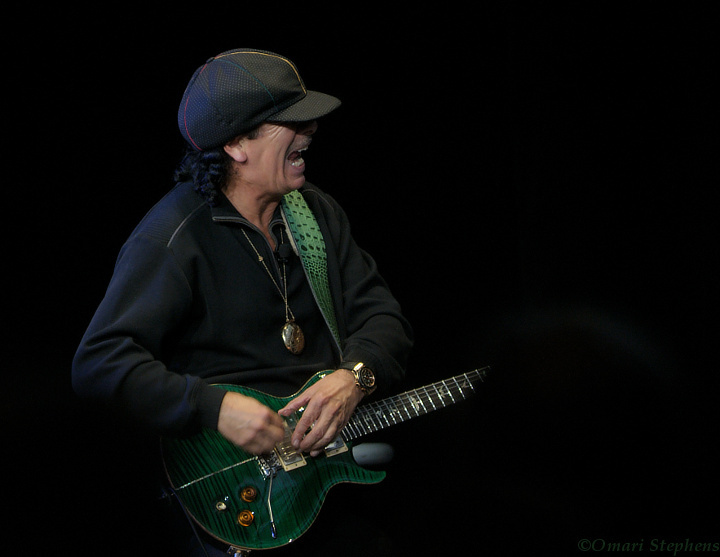 Santana gave a slight bow, took his guitar off, thanked his co-performers, and the three left the stage.